Gray snow mold is caused by two species of Typhula: T. incarnata and T. ishikariensis. This is a true snow mold in that it requires extended periods of snow cover, at least 60 days, in order to develop. Symptoms of gray snow mold develop under snow cover and become evident as soon as the snow begins to melt. The disease appears in perfect circles or irregular patches up to 3 feet or more in diameter. The turf within these patches is white or gray and matted together. Examination of the diseased plants reveals tiny tan or brown pea-like structures (sclerotia) on the infected leaves or imbedded within them. Gray snow mold is most severe when heavy snow falls on unfrozen ground. 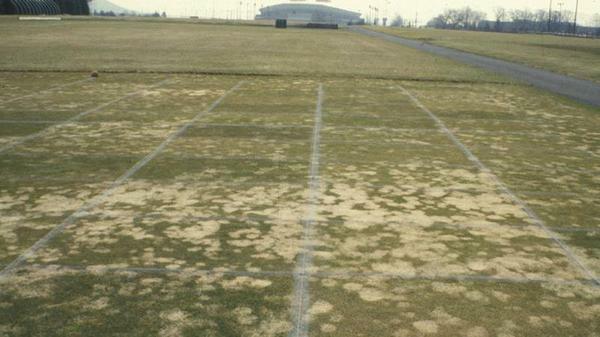 In severe cases, gray snow mold can kill large areas of turf, and recovery can be extremely slow. The gray snow mold pathogens survive the summer as sclerotia in the thatch and soil. Sclerotia germinate in the fall when temperatures are between 50°F and 65°F, yielding spores and mycelium that cause new infections. Gray snow mold is most severe when the temperature of the turf surface is maintained at or above freezing for extended periods. Heavy snow accumulations on unfrozen ground or accumulations of leaves or mulch provide ideal conditions for disease development. Excessive nitrogen fertilization, infrequent mowing, or high mowing heights going into winter also enhance disease by providing a dense, lush canopy for the pathogen to attack. Do not apply nitrogen when cold weather is expected or before the first expected prolonged snow cover. Continue mowing in the fall until foliar growth stops completely. These steps will prevent a buildup of lush foliage that is highly prone to gray snow mold. In regions where heavy snow is anticipated, take steps to minimize the duration of snow cover. Erect snow fences or plant landscape plants in strategic locations to prevent excess snow accumulation. Prevent traffic on snow-covered turf, as compacted snow will melt more slowly and increase damage from gray snow mold. Where gray snow mold is a persistent problem, preventative fungicide applications should be made prior to snowfall, but preferably after the last mowing of the season. 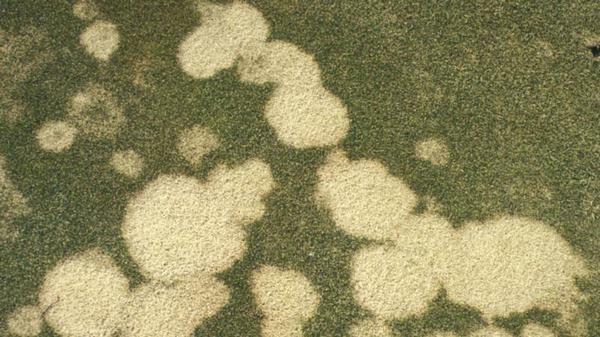 Tank-mixtures of multiple fungicide chemistries are best for the management of gray snow mold. Combinations of DMIs, SDHIs, dicarboximides, and cholorothalonil are highly effective. 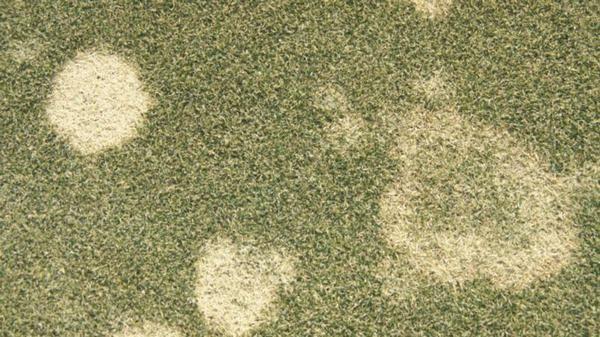 Please consult the Snow Mold Fungicide Website for the current information on effective snow mold treatment. Figure 1. Gray snow mold stand symptoms. Figure 2. Gray snow mold stand symptoms. Figure 3. Gray snow mold stand symptoms.